November brings us squashes, ideas for using all those Halloween goodies and organic veg boxes plus something new coming to 3Style Kitchens! Season’s Eatings – what foods are in season for November? Squashes are in season at the moment. Unfortunately the wet weather recently has not been kind to pumpkins and many have rotted in the fields (Farmer Copley’s actually ran out this year before Halloween and had to continue their pumpkin festival without them!). This had an impact on the number of carving pumpkins available for Halloween but there are still plenty of varieties of squash available for cooking in the shops. Pumpkins and butternut squashes seem to get all the glory but there are lots of other squash varieties that have distinct flavours and textures that work well in different dishes. Plus they have really cool names like sugar pie pumpkin, blue Hokkaido pumpkin and hubbard squash. Here’s an overview of the different kinds of squash and how they can best be used in cooking. We are fresh on the back of Halloween, in fact some of you may still have smudges of face paint remaining! If you have children then you will no doubt be surrounded by buckets of Halloween sweets gained from trick or treating and parties. If you’re anything like us you’ll probably have all the sweets collected plus a load left that you got in to dish out only for nobody be there to dish it out because you were too busy trick or treating! 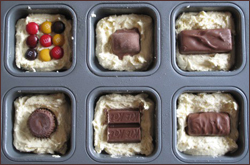 Chop your chocolate bars into chunks and place inside the batter of each cup-cake before baking (see main picture above). You won’t see them when baked but you’ll discover a lovely gooey centre when you bite in (still warm from the oven is especially delicious). Kids will enjoy helping you make them, especially placing the chocolate inside. Give some away if you’re feeling generous or scoff the lot! Click here for full details. We’ve all seen the fancy chocolate slabs in the shops at Christmas, often mixtures of different kinds of chocolate with sweets, nuts and fruits added. Why not create your own. Simply melt chocolate into a tray or silicon mould – use a standard baking tray, a disposable foil one that you can leave it in or even a fancy Christmas one to create a seasonal shape - add whatever sweets and treats to the top and let it set in the fridge. Put them into clear presentation bags and you have cheap Christmas stocking fillers. Click here for full details. If you want to ration the sweets out a bit so the kids’ teeth don’t fall out by Christmas how about this idea for a candy calendar which works like an advent calendar. Use paper cups, place sweets in each one and then glue tissue paper over the top. Number them for each day of November so they get a little something every day. You could even do this instead of an advent calendar. Click here for full details. In last month’s Foodie Blog I mentioned that I had started getting a weekly fruit and veg box. The veg is organic and they put in whatever is in season. Most of it is grown on local farms although I’m pretty sure the bananas and mango that came in mine were not! What I like about it is the different types of fruit and veg that I would never normally buy. So far I’ve had cavolo nero, physalis (careful how you say that one! ), romanesco broccoli and baby turnips as well as the usual potatoes, carrots, leeks etc. The most interesting item I’ve had is a kabocha squash. I was amazed to find it had the taste and texture of roast chestnut. I will definitely be buying that again! There are 2 small downsides. 1. Having been spoiled by supermarket, ready washed items, these come fresh from the field so there’s a fair amount of scrubbing involved to prepare them and 2. I don’t seem to be able to get through the amount of veg I have in! I had to make 2 giant pots of soup recently to use them up though that’s not necessarily a bad thing – we now have enough soup in the freezer to keep us going all winter! The veg box that I get is from Riverford Farms and they also come with recipe cards. I recently visited the Grand Designs Live show to check out what’s new and current in kitchen design. If you missed my post on it you can see it here. We are about to introduce a brand new service to 3Style Kitchens, and it’s nothing to do with kitchens! We’re just putting the final touches to the website and all will be revealed very soon! 1 Response to "The 3Style Foodie Blog – November"